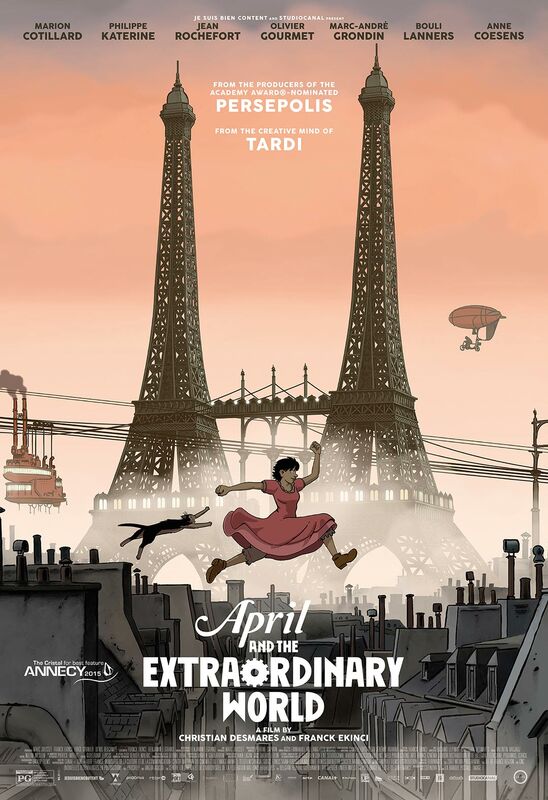 April And The Extraordinary World (aka Avril et le Monde truqué) (2015) is a film that I hard a hard time connecting with. J'aime l'animation (sorry, had to)—a blend of steampunk stylings and apparently based on French cartoonist Jacques Tardi (though I think the clean, simple lines are very reminiscent of Hergé's The Adventures Of Tintin (1929–1976)). April is a mishmash of ideas, characters, tropes and archetypes that never fully gelled for me—I think it would have benefitted from simplification, better characterization and perhaps even a longer running time (in fact, it could have been great as a miniseries). Still, it's beautifully animated, fun and worth a watch.